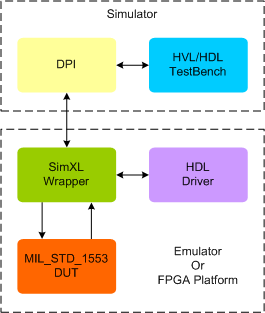 MIL-STD-1553 Synthesizable VIP provides a smart way to verify the MIL-STD-1553 component of a SOC or a ASIC in Emulator or FPGA platform. The MIL-STD-1553 Synthesizable VIP is compliant with MIL-STD-1553B specification and verifies MIL-STD-1553 interfaces. It includes an extensive test suite covering most of the possible scenarios. It performs all possible protocol tests in a directed or a highly randomized fashion which adds the possibility to create most wide range of scenarios to verify the DUT effectively.